Every year, hundreds of small colleges, state schools, and large, research-oriented universities across the United States (and, increasingly, Europe and Asia) revisit their core and general education curricula, often moving toward more integrative models. And every year, faculty members who are highly skilled in narrowly defined fields ask two simple questions: "Why?" and "How is this going to affect me?" General Education Essentials seeks to answer these and other questions by providing a much-needed overview of and a rationale for the recent shift in general education curricular design, a sense of how this shift can affect a faculty member's teaching, and an understanding of how all of this might impact course and student assessment. 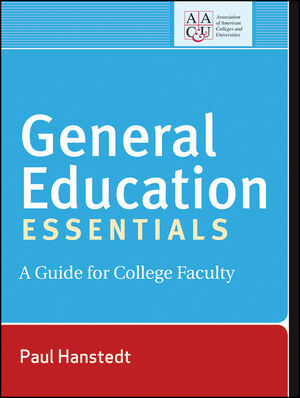 Filled with examples from a variety of disciplines that will spark insights, General Education Essentials explores the techniques that can be used to ensure that students are gaining the skills they need to be perceptive scholars and productive citizens. Paul Hanstedt is a professor of English at Roanoke College and the recipient of a FIPSE grant for sustainable faculty development, several teaching awards from three different institutions, and an Innovation Award for helping to create greater collaboration among faculty at his home institution. Association of American Colleges and Universities (AAC&U) is the leading national association concerned with the quality, vitality, and public standing of undergraduate liberal education.